The CopyStorm/Director Database contains definitions of all CopyStorm jobs, their history, and the schedule(s) for when they should run. The CopyStorm/Director application is a rich GUI for editing and searching the content of a CopyStorm/Director Database. The CopyStorm/JobRunner is a command-line tool that runs jobs defined in the CopyStorm/Director Database. In addition to the CopyStorm/Director components, installations of CopyStorm and CopyStorm/Medic are required. CopyStorm/Director can use any supported version of CopyStorm. The CopyStorm/Director database can be hosted in any relational database supported by Capstorm. Though the CopyStorm/Director Database can be kept with other tables, Capstorm recommends that a private database or schema is created to hold CopyStorm/Director data. Like other Capstorm products, CopyStorm/Director automatically creates the necessary database schema the first time it attaches to a database. A portable Java application that will run on any Windows, Linux, or Mac system. A web application which that will run in any container supporting Java Servlets. For example, Tomcat or Jetty. CopyStorm/JobRunner is a command line tool designed to be invoked by a native system scheduler — Windows Scheduler or CRON on Linux / Mac. 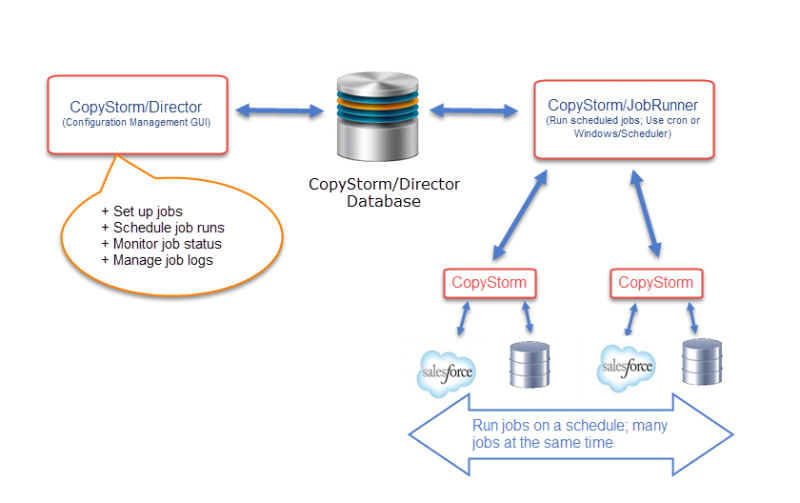 The primary purpose of CopyStorm/JobRunner is to run jobs on the schedules specified in the CopyStorm/Director Database and to record the results of each run (also within the CopyStorm/Director Database).